Branson, MO – Team members from all six Myer Hotels, Branson’s award-winning hotel company, recently participated in a food drive in support of Christian Action Ministries (CAM). Christian Action Ministries has served over 4,900 families already this year, more than 12,000 individuals. CAM Executive Director Pat Davis accepted the donation and expressed appreciation for the continued support of Myer Hotels and all of the employees. “Heather Albaugh, Executive Housekeeper at Best Western Center Pointe Inn challenged the other 5 housekeeping teams within Myer Hotels—all teams responded with a tremendous effort.” stated Brian King, Assistant General Manager of the Best Western Center Pointe Inn. 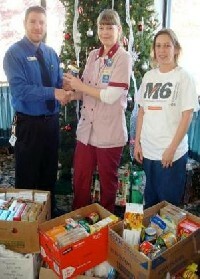 A total of 520 food items were collected through the month of November. The Myer Hotels team achieved an increase of 15% over last year. “We had fun contending to see which property could donate the most canned foods, and enjoyed helping CAM provide groceries to thousands of our neighbors here in the Branson area. We were blessed to be a part of this good effort and thank everyone who joined in the food drive,” expressed Chris Myer, Vice President of Marketing for Myer Hotels. In addition, Myer Hotels has challenged all other hotels in greater Branson to match or exceed their total. In the lodging business for over 40 years, the Myer family has actively contributed to Branson’s hospitality market for over 28 years and received numerous national awards. Myer Hotels includes the Best Western Center Pointe Inn, Best Western Music Capital Inn, Comfort Inn at Thousand Hills, Comfort Inn & Suites Branson Meadows, Comfort Inn West, and Holiday Inn Express Green Mountain Drive. The properties emphasize excellent locations, countless amenities and exceptional customer service while focusing on great value in the upper mid-scale area. For more information about these hotels please visit www.myerhotels.com.